Incontinence can be troublesome and at times frustrating to deal with, especially considering the fact that it is nigh on impossible to predict when you might experience a leak. In addition to the exercises and preventative measures, you can take for incontinence and an overactive bladder, there are several herbal remedies that some women find effective. Learn more about natural approaches you can take below. An alkaloid called yohimbine can be obtained from the bark of a tree known as Pausinystalia yohimbe, which is native to Central Africa. It has been used to make herbal supplements that are said to be able to assist with weight loss. One of its side effects includes water retention. For this reason, it can be useful as an anti-diuretic. It is important to seek advice from your doctor regarding the potential use of this herb in this way, as yohimbe can have contraindications with other medications and conditions. Specifically, pumpkin seed oil has been scientifically investigated for its ability to treat urinary disorders such as an overactive bladder. Further research is required in order to fully understand how the oil affects bladder behavior, but it is thought that sitosterols are responsible for the action. One of the advantages of using pumpkin seed oil supplements as a treatment for incontinence is that it is considered safe. 96% of patients who took part in a recent study reported no undesired side effects. Often, an overactive bladder is caused by a urinary tract infection. This condition causes the bladder to contract involuntarily, creating the sensation of needing to urinate. Many women find cranberries in fresh fruit, juice, or supplement form to be a successful method for treating such infections. Although there is still much scientific deliberation about the viability of this, many herbalists retain that cranberries can vastly alleviate the strength of a urinary tract infection. Ginseng has a number of natural health uses, one of which is for the treatment of diseases that affect liver and bladder functionality. The scientific mechanisms behind how it works in the body is sufficiently investigated, and it is believed that it has antidiuretic action that can help to reduce the frequency of urination. However, ginseng can cause side effects, from headaches and diarrhea to more serious reactions in those who suffer from allergies – such as breathing difficulties. 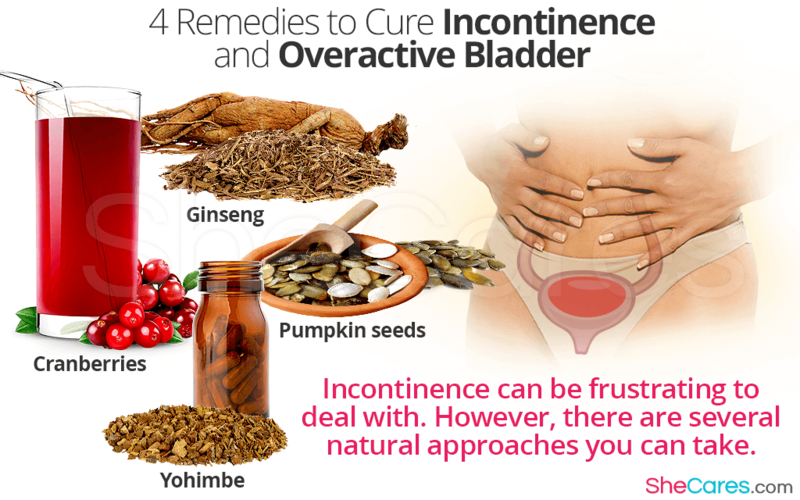 These are just four of the more common natural remedies that can be recommended for a urinary incontinence cure. It is advisable to talk to your doctor about your incontinence in order to determine the possible reasons behind it, as knowledge about the causes can help you to discover what the most effective treatment will be.